Sean Price – Jamaican. I can’t recall the original sample used here, but I know this is a throwback to BDP‘s “Stop the Violence”. Of course, when the chorus runs “Grab your dicks and let the clip pop”, you know that the Teacha‘s message isn’t entirely intact here. That said, the joint is hot. And if you haven’t heard of Sean P yet, well, I don’t know what to tell you. I guarantee you’ll get the hook caught in your head. Don’t blame me if you get in trouble for repeating it in third period. Buncha high-school bastards (check out seanprice.com). Ike Eyes f/ Agallah - On My Grind. If any of the songs in this episode could incite a riot, it’s probably this one. Agallah is on production and lends some bars, and of course my man Ike Eyes comes through with some lyrics that are at once hard and esoteric. You can’t really argue with that. (more info on Ike at his myspace). Ike Eyes f/ Rebel Relz & Tito I – It’s a Shakedown. Before I forget, I have to give a shout to Ike for holding me down here with these two exclusives. Ike emailed these two to me literally about four days ago. Be on the lookout for an interview with dude, coming Real Soon Now (TM). And that’s it for episode #26. Thanks to all the MCs, producers, artists in general, labels, and what have you that helped make this one possible. 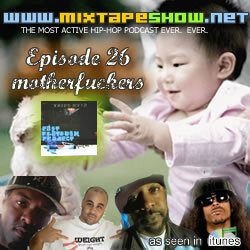 Be on the lookout for Episode #27 – it’s gonna be an interview, but not with an MC, per se. Trust me though, it’s gonna be one of the most important 30 minutes you’re going to spend for a long while. Here’s a hint: It’s with the dude who is making the bling documentary. This entry was posted in episodes and tagged agallah, boogie down productions, dox, east flatbush project, episodes, ike eyes, klassic, krs one, pok dog, purple city, rebel relz, sean price, stress, tito i by dex digital. Bookmark the permalink. hahaha, and NaN comes through a year later for the sample correction. Good looking out though – I’m about to cop the original..